Thanks for stopping by! I hope you're having a great ! Earlier in the year, I threw a party for my brother and his family who were in town visiting as a way for our friends and family to all get to see him in the short few days he was here. I also wanted to come up with a fun and cute way to have a guestbook that they could take with them as a keepsake. 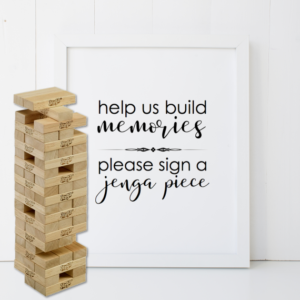 I ended up buying a Jenga game off of Amazon and putting up a sign for our guests to sign the Jenga game pieces, as a “guestbook” of sorts for my brother to take home. This way, they could play the game but also read and remember the cute messages that everyone left for them. You can now purchase the print I made to put up next to the Jenga pieces for our guests to sign here. I’ve recently been catching up one a few TV shows, thanks to Netflix, that I didn’t catch during the time they were actually on TV. Because I’ve been spending so much time working on Rosebud Print Co., I can have the shows on and watch/listen while I work. So far, I’ve made a pretty good dent in my list of “to watch” shows. It took me a good 6 episodes before I was able to be fully interested in this show, but I’m really glad I stuck it out because I ended up really loving it. I really loved the characters and I think the fact that you sympathize and cheer Dexter on is all on account of really good writing. I never gave Lost a chance when it first aired because I didn’t know anyone that was really that into it. After I started watching it, a few of my friends and coworkers raved about how it was the best show ever. I blew through the 6 seasons in 3 weeks while working on my shop and was really sad to see the series come to an end even though I felt the story line was getting far too confusing! Have a recommendation for me? Please leave your suggestion in the comments! 21 Aug Can’t Get Enough TV! 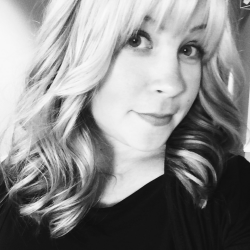 Leslie. 35. San Jose. In love. Two chihuahuas. Handbags & Hockey is a participant in the Amazon Services LLC Associates Program, an affiliate advertising program designed to provide a means for sites to earn advertising fees by advertising and linking to amazon.com.